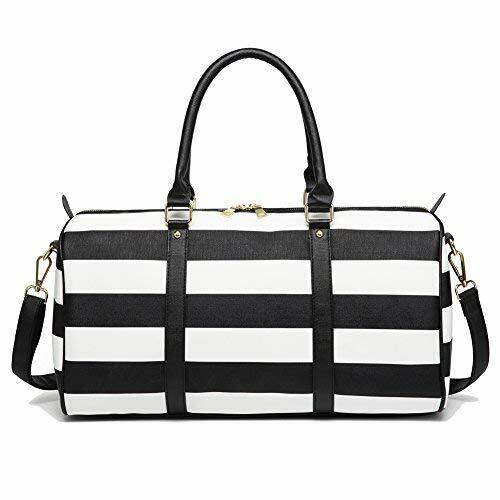 【NEW STYLE】 Simple and stylish travel bag, with black and white wide stripes and no messy outside pockets, gives a neat, generous and elegant feeling. 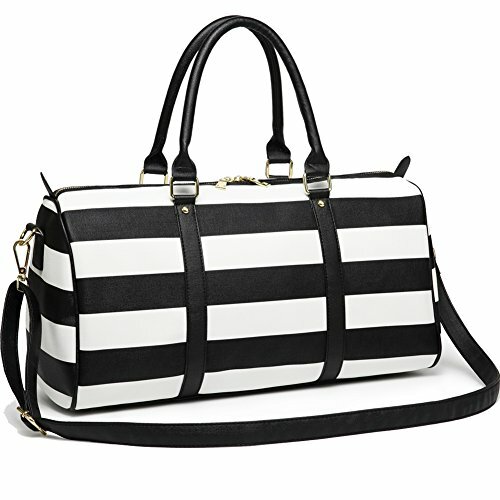 Made of environmentally friendly PU leather, cotton lining, pure copper hardware, waterproof, durable and easy to clean. 【LARGE CAPACITY】 Dimension: 18.5 × 9 × 7.9 inches. 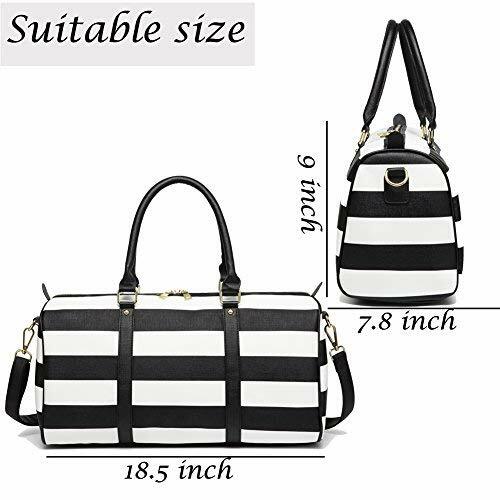 You can carry laptop, A4 books, clothes, shoes, cups, cosmetics, toiletries and other daily necessities. 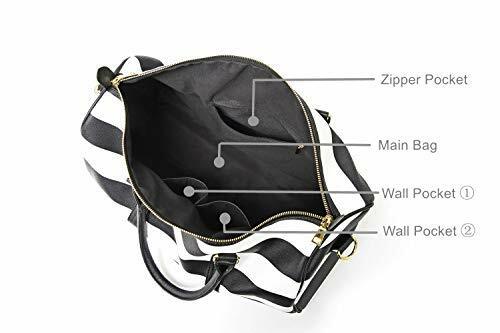 The multi-pocket design allows you to sort things in your weekender bag. 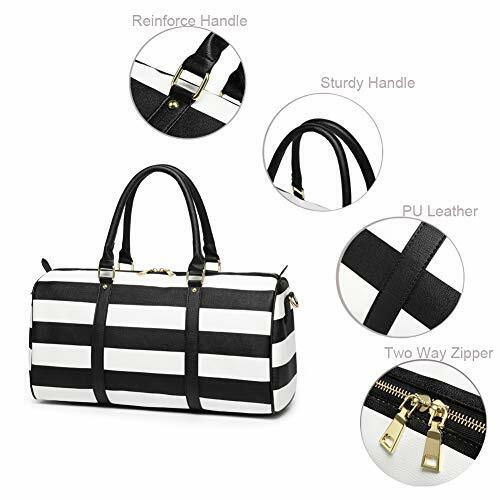 【EXQUISITE WORKMANSHIP】 Two ways tungsten zippers, is smooth to pull, quality tungsten buckle; four bottom rivets can prevent the weekender bag from fray, the rounded handles makes it comfortable as a carry on handbag . 【ADJUSTABLE COTTON STRAP】 The strap is adjustable and can be extended from 43 inches to 47 inches. When the carry on bag is full, the strap will not hurt the shoulder. 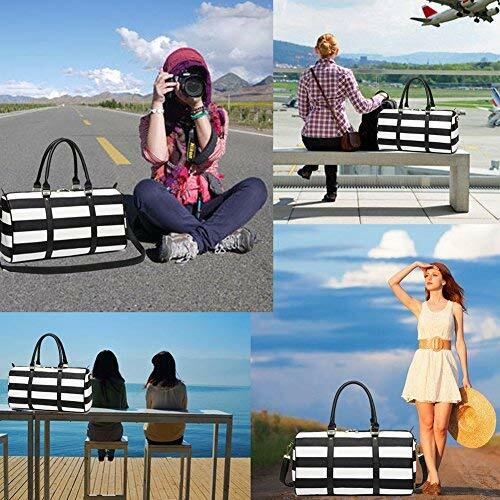 【OCCASIONS】 Ideal for use as a weekend bag, travel bag, overnight bag, hospital bag, tote bag, flight bag, shoulder bag, and gym bag, this is a very good travel bag for 3-5 days trip, this PU leather bag also can be used as a carry on the plane package.